“All around the world people are rising up against corruption in government. 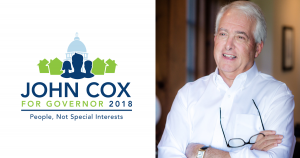 … I’m going to clean out the barn in Sacramento,” Cox told Fox News the morning after the California primary in which he placed second behind California Democrat Lt. Gov. Gavin Newsom. 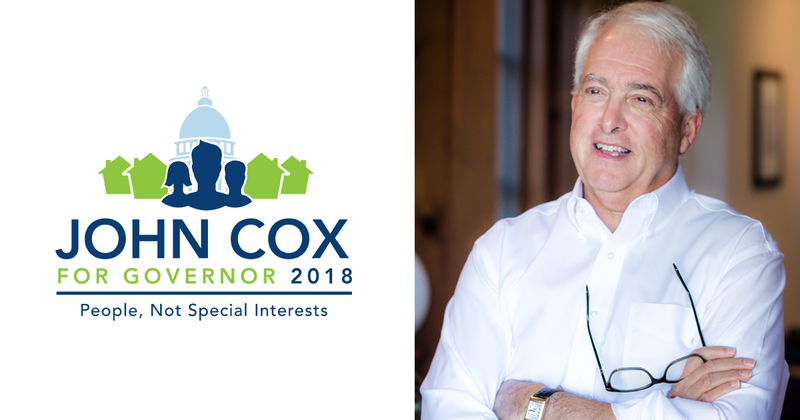 Businessman John Cox has run for political office several times, but actually cut his teeth as a conservative leader years ago when he served on Jack Kemp’s national steering committee, and as Newt Gingrich’s California Finance Chair. Cox helped lead the successful effort to remove disgraced Democrat Mayor Bob Filner in San Diego, and was a major backer of the Paycheck Protection campaign to rein in the corrupting power of the public employee unions. When we talked, Cox was on his way to a Facebook Live event at the Brady Bunch house, from the 1970’s television show, in North Hollywood. The iconic ranch-style, 3-bed, 3-bath house, only 2,477 square feet, is on the market for nearly $2 million! “Mike and Carol Brady could not afford their house today,” Cox said. In the show, Mike Brady a widowed man with three sons, was an architect who designed the house they lived in. He and Carol, who had three daughters, married and lived in the Brady home with their blended family. For the record, my 29-year old son just bought a 3-bed, 3-bath house on 3/4 of an acre, with a swimming pool, in a coastal town in Virginia for $360,000. “Government regulations are preventing the construction of new homes, and costs are being driven up like crazy,” Cox added. Cox calls those responsible for California’s failing status, “out-of-touch-elites,” of which “Gavin Newsom is the poster boy.””These elitists just told us we’re going to have to live on half the water we currently use,” Cox said, referring to Gov. Jerry Brown’s recent bill signed restricting every California resident to 55 gallons per day until 2025, 52.5 gallons from 2025 to 2030 and 50 gallons beginning in 2030 — or receive a fine of $10,000 a day. Most California households will have to choose between showering, or doing a load of laundry under these ridiculous daily restrictions. And forget about taking a long, lingering bath without penalty since most large bathtubs hold more than 100 gallons of water. Demonstrating that California’s droughts are naturally occurring, and its water shortages are government created, Cox said he recently read Let There Be Water by Seth M. Siegel, which shows how Israel, even with 60 percent of its country made of desert, has not only solved its water problem; it also has an abundance of water, and even supplies water to its neighbors – the Palestinians and the Kingdom of Jordan – every day. “We live next to the largest body of water in the world,” Cox said. But the newest Carlsbad desalination plant cost three-times more to build than Israel’s, due to high labor costs and environmental regulations and interferences. And the plant is delivering much less water than expected. “Desalination, along with drip irrigation, water recycling and sustainable water conservation policies – has increased Israel’s water supply and amazingly, transformed its water shortage into a water surplus,” NoCamels Israeli Innovation News reported. “The people of this state are tired of being deceived and told only half of the story,” Cox said. “We’ve got to repeal Jerry Brown’s massive $52 billion gas tax increase,” he said. The gas tax increase, which would raise $5.4 billion a year to ostensibly pay for infrastructure repairs and expansion to the state’s roads, bridges and transportation systems. This $52 Billion Gas Tax Increase has been undergoing a serious repeal effort, and is now on the November ballot as Proposition 6. ‘Not enough taxes’ are not the reason for California’s poor roads; Democrats are the reason. “California’s crumbling roads and highways are the direct result of failed leadership in Sacramento, where billions of transportation dollars have been diverted to pay for other things,” the Fresno Bee editorial board said in April. There is nothing in the gas tax legislation, SB 1 by Sen. Jim Beall (D-Campbell), signed into law by Gov. Brown, to guarantee the $52.4 billion raised by the gas tax will actually go to roads. But gas increased more than the 12 cents a gallon promised, diesel 20+ cents a gallon, electric car owners now pay an annual fee of $100, and it increased the registration for all vehicles by $38 – $175. In fact, “30% of the new tax revenues will go to projects other than roads (including parks, workforce apprenticeships, rural bike lanes, boats, trains and local planning grants) and that the plan mandates that less than 5% of funds can go to traffic relief or lane expansion,” Jon Fleischman reported in Breitbart. “If we start spending like Texas does — efficiently – we’re going to get much more roads and highways – twice as many roads,” Cox said. “We definitely need another governor to make this happen.”he added. Cox talked about a full-page advertisement in a July San Francisco Chronicle placed by an anonymous resident of the city, “to draw attention to the city’s homelessness crisis after an alleged experience with a scissors-wielding homeless man in a downtown cafe left her feeling ‘horrified,’” Yahooreported. “The ad is signed by ‘Fed Up Populace Campaign,’” Cox said. This entry was posted on Wednesday, July 25th, 2018 at 1:03 am and is filed under Blog Posts.